NEW YORK — More than 200 mementos from decades of human spaceflight are offered for sale this week at an auction marking the 50th anniversary of the first American to fly in space. On Thursday (May 5), beginning at 1 p.m. EDT (1700 GMT), bidders can compete for items ranging from the dramatic to the bizarre. Documents from NASA's ill-fated Apollo 13 moon mission are for sale, as well as gold medals, signed photographs, Russian spacesuits, a tissue box that flew to the moon, and a 100-foot (30-meter) scale model of the Concorde (that once perched atop a building in Times Square). In a sunlit Madison Avenue showroom at the Bonhams auction house here, the most noticeable items on display are two spacesuits posed in front of Soviet-era posters. One suit, remarkable for the dual Soviet-American flag patch on one shoulder, was worn by cosmonaut Alexei Leonov, commander of the Soyuz 19 spacecraft, during the historic 1975 Apollo Soyuz Test Project when the Americans and the Soviets met in space. It was the first time spaceships from two different countries ever linked up in orbit. Haley said the Leonov suit, priced in the $100,000-$150,000 range, is expected to fetch the largest sum at this week's auction. "The great thing about this is that because it's an American mission and a Russian mission, it will hopefully create some competition between American collectors and Russians," Haley said. This week's space stuff sale isn't the first tied to historical events this year. Just weeks ago, on April 12, a Soviet-era Vostok 3KA-2 space capsule used in an unmanned 1961 mission was sold to a Russian collector for $2.9 million at a Sotheby's auction. That sale was timed to mark the 50th anniversary of the first-ever human spaceflight by cosmonaut Yuri Gagarin. Haley said the Vostok 3KA-2 auction, which is believed to be a record for the biggest sale for space artifacts, is a sign that the Russian market for space memorabilia is a healthy one. 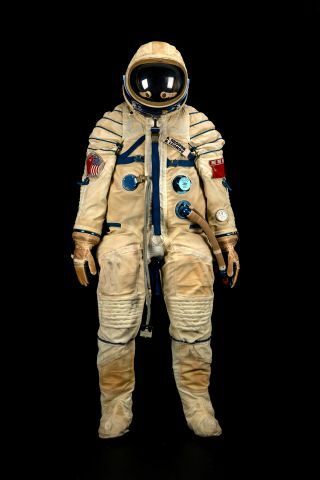 The second spacesuit on the auction block, worn by cosmonaut Gennadi Strekalov during a four-month mission to the Mir space station in 1990, is expected to fetch between $60,000 and $80,000. "They do seem awfully small, but they have some stretch in them, I think," Haley said. Donning white gloves, Haley pointed out one of the more unusual highlights of the sale, and a memento of non-human spaceflight: a bronze-colored tag stamped with the number 65, worn by Ham, the first chimpanzee in space. Haley displayed several photos of Ham wearing the tag — in some views the chimp looked happier than in others. The astrochimp tag is one of the more affordably priced items in the sale, estimated to go for between $2,000 and $4,000. On the high end is a Bulova stopwatch, a timepiece carried to the surface of the moon on board Apollo 15, which could fetch as much as $180,000. Commander Dave Scott used the watch to time engine burn during the lunar landing, and the face still bears a piece of duct tape marking 24.5 seconds — the crucial moment when the module's engine had to shut off. On the back of the elegant watch is a red square of Velcro, used to keep the timepiece from floating around the cabin in the zero-gravity conditions of space. In addition to various space oddities — a 1993-era Nintendo Game Boy, complete with a game of Tetris still inside, that helped entertain a Russian cosmonaut during a 196-day mission aboard the Mir space station — there are dozens of documents, letters and photographs from the files of James Webb, NASA administrator during the height of the space race. "The idea that some of these photos hung in the office of the guy who was running NASA in the '60s is just fantastic," Haley said. The May 5 auction is the third space history sale at Bonhams, and the first in which online bidding is an option. Although many items are indeed pricy, there are options at the Bonhams for space enthusiasts without lots of disposable income who'd like a piece of space history. Some photographs might go for as low as $200, Haley said. "We've had interest from kids who are saving up their allowance money," he said. Andrea Mustain is a staff writer for OurAmazingPlanet, a sister site to SPACE.com. Follow her on Twitter @AndreaMustain, and get the latest space science and exploration news by following SPACE.com @Spacedotcom and on Facebook.